The events will take place at the University of Algarve, Faro, a young state university located in the southeastern part of Portugal. The University has four campi but the meetings will take place at campus Gambelas (GPS Coordinates: 37°02'34.9"N 7°58'15.6"W), at "Green" Amphitheater (basement, building #8). 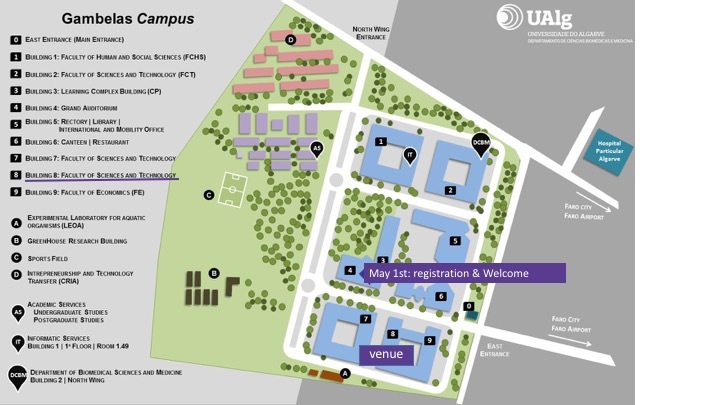 On May 1st registration and welcome reception will take place at building 4 in the map. From May 2nd to 6th, the venue is "Green" Amphitheater (basement, building #8).